After a long and hard-fought heads-up battle, David 'Dragon' Pham has earned his third World Series of Poker bracelet in Event #12: $1,500 No-Limit Hold'em. He defeated a tough competitor in Jordan Young, and pocketed $391,960 for his efforts today. The final table lasted about seven hours and 40 minutes and took a total of 230 hands. Heads-up play made up the bulk of that, ending in 130 hands and three hours of play. This event attracted a total of 1,739 entries for a total prize pool of $2,347,650, paying out 262 spots. In the final hand, Pham shipped it in on the button and Young called after looking at one card - an ace. Pham tabled king-nine and Young slowly peeled a seven as his kicker. The board appeared to be safe for Young, but a king came on the river and it was all over. Young earned himself $242,160 for his deep run today. Young came in to heads-up play with a very large lead, but Pham chipped away and eventually closed out. Pham has amassed just shy of $10,000,000 in earnings after this win, including WSOP bracelets from 2001 in the $2,100 S.H.O.E. event, in 2006 in the $2,000 No-Limit Hold'em Shootout and today's event, 11 years later. Pham has 33 recorded wins, along with a myriad of final tables. He also now has 25 six-figure cashes, with his largest coming from his runner-up finish in the 2007 Legends of Poker $9,700 Main Event for $800,185. 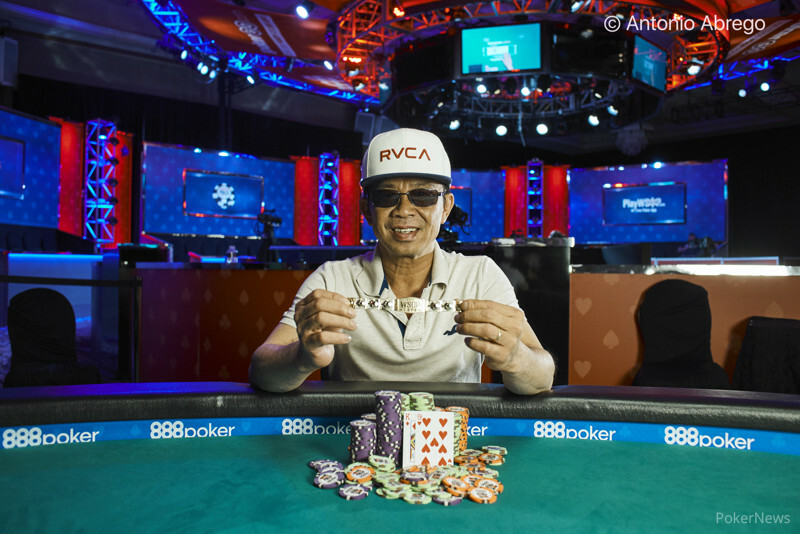 When asked what it felt like to win after so many years, Pham responded, "Of course the money comes first, but winning a bracelet means so much! It took me 10 years to win again." His rail, along with Young's, was loud and supportive and stood by him for the majority of the day. 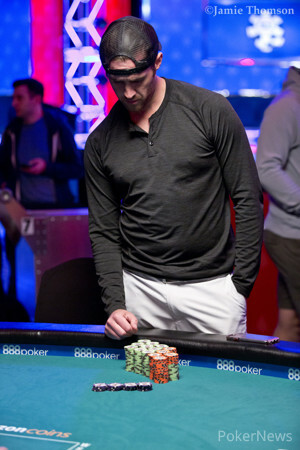 Some of the notables that made the money in this event include Phil Collins (19th place - $12,135), Mike Sexton (26th place - $12,135), Mike Leah (27th place - $12,135), Michael Gagliano (61st place - $5,795), Loni Harwood (74th place - $4,315), and Andy Frankenberger (107th place - $3,055). Marquis Mccain (10th place - $23,964) was the first elimination from the final table after he lost a race situation to Melissa Gillett. Not far behind him was Aditya Agarwal (9th place - $30,774). Agarwal lost most of his chips once reaching the final table and was unable to hang on to a short stack. The eliminations were coming quickly as Huihan Wu (8th place - $39,969) was next to fall when he ran into Roman Korenev's set of threes. Billy Rodgers (7th place - $52,503) came across a cooler situation when his ace-king of clubs wasn't good enough to beat Pham's pocket aces. After the dinner break, Nathan Pfluger (6th place - $69,741) ran his pocket pair of sixes into an over pair of Young and could not catch a set. In one of the biggest hands early on, Kevin Trettin (5th place - $93,667) turned a full house but his opponent, Young, would river a bigger full house sending him to the rail. Just a few hands later, Gillett (4th place - $127,180) the principal from Australia, lost a big hand and was left with only one big blind. She would get her remaining chips in against two players but was unable to find any help. The remaining three players were still fairly deep but it would be Roman Korenev (3rd place - $174,559) getting all of his chips in the middle in a dominated position vs Pham. Both players flopped top pair but Pham held the better kicker eliminating Korenev and setting up an epic heads-up match between Pham and Young. That wraps up the action in this event, but there is plenty more to follow, so keep checking back as PokerNews keeps bringing you all of the action throughout the rest of the series. Hand #230: David Pham moved all in from the button and Jordan Young looked down at one card only. After looking at the , he called and the hands were turned over. Young had the to go with his ace and Pham held . The board was looking good for Young to double up . However, the landed on the river giving Pham a pair of kings. Jordan Young put up an excellent fight against one of the all-time greats in poker history and showed unbelievable class throughout the heads-up battle which Pham even acknowledged. Young will take home $242,160 for his efforts today and can now enjoy a couple of beverages with his enthusiastic rail. Hand #225: David Pham gets a walk. Hand #226: David Pham called on the button and Jordan Young checked. The flop was and Young checked. Pham bet 125,000 and Young called to see the turn. Young jammed all-in and Pham folded. Hand #227: David Pham received a walk. Hand #228: David Pham moved all-in and Jordan Young folded. Hand #229: David Pham got another walk. Hand #220: Jordan Young got a walk. Hand #221: Young raised to 210,000 on the button and David Pham called. The flop came and Pham check-called a bet of 205,000 from Young. The turn was the and both players checked to the on the river. Pham led out for 550,000 and Young folded. Hand #222: Pham limped in, and Young checked. The flop came and Young check-called a bet of 125,000 from Pham. The turn was the and Young check-called a bet of 200,000 from Pham. The river was the and Young checked. Pham bet 800,000 and Young folded. Hand #223: Young limped in, Pham moved all in and Young said, "No thank you" and folded. Hand #224: Pham limped in and Young checked. The flop came and both players checked to the turn, which was the . Young bet 150,000, Pham raised to 350,000 and Young folded. Hand #215: Jordan Young raised to 225,000, and David Pham called. The flop was , and both players checked. The turn was the , and Young bet 200,000, which Pham called. On the river, Young bet another 450,000, and Pham called. Young tapped the table, and Pham showed to win the hand. Hand #216: Pham limped the button, and Young shoved all in, getting Pham to lay his hand down. Hand #217: Young raised to 200,000, and Pham folded. Hand #218: Pham gets a walk. Hand #219: Young raised to 225,000, and Pham called. The flop came , and Young bet 300,000 to take down the pot. Hand #209: Jordan Young raised to 225,000, and David Pham folded. Hand #210: Young got a walk. Hand #211: Pham got a walk. Hand #212: Pham raised to 250,000, and Young called. The flop came , and Young check-folded to a bet of 275,000 from Pham. Hand #213: Young raised to 350,000 and got no action. Hand #214: Pham limped in, and Young checked. The flop came , and Young checked. Pham bet 100,000, and Young mucked his hand. Hand #204: David Pham raised to 200,000, and Jordan Young called. The flop was , and Young checked to Pham, who bet 250,000. Young called, and the turn was the , which both players checked. The river was the , and Young bet 150,000. Pham called, saw the of his opponent, and mucked. Hand #205: Young limped his button, and Pham checked. 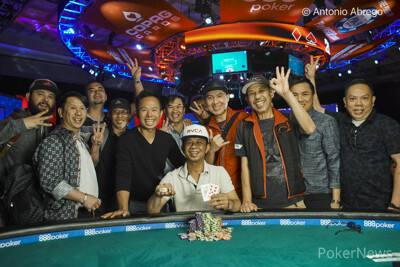 The flop was , and Young won the pot with a bet of 150,000. Hand #206: Pham raised to 250,000 and won the hand. Hand #207: Young raised to 200,000, and Pham called. Both players checked to the turn with the board reading , and Young bet 300,000. Pham folded, and Young won the pot. Hand #208: Pham raised to 275,000, and Young folded. Hands #199-203: "Hurry Up! We're Hungry!" Hand #199: Jordan Young raised to 175,000 on the button, and David Pham called. The flop came , and Pham check-called a bet of 200,000 from Young. The turn was the , and both players checked to the river, which was the . Pham led out for 650,000, and Young called. Pham tabled for a rivered set of deuces. As Pham was raking in the pot, a person on his rail yelled out, "Hurry up! We're Hungry!" The entire rail burst into laughter. Hand #200: Pham raised to 200,000 on the button, and Young called. The flop came , and both players checked to the on the turn. Young checked, Pham bet 225,000, and Young moved all in. Pham smiled and folded. Hand #201: Young raised to 175,000, and Pham folded. Hand #202: Pham limped in on the button, and Young checked. The flop came , and Young check-folded to a bet of 125,000 from Pham. Hand #203: Young limped in on the button, and Pham checked. The flop came , and Pham check-called a bet of 80,000. The turn was the , and Pham check-called a bet of 280,000 from Young. The river was the . Pham checked, and Young paused for a moment before betting 125,000. Pham called. Young tabled for a pair of nines and scooped the pot.